A few blog post's ago you may remember I started a series on my blog called "Cheaper Then", and what it basically is, is me finding you a cheaper version of a more expensive product. In the first Cheaper Then blog post #1 - Cheaper Then I compared lip balms which with the cheaper version you could save up to £5.50 so be sure to check that post out. Right now back to today's blog post, with the Christmas festive's already starting and Christmas day literally around the corner most of us do like having Christmas scented candles burning around the house for that lovely smell. I'm usually an apple & cinnamon kind of candle girl, but this year I've decided to try out a different scented candle. As much as I absolutely love Yankee Candles, I don't like the price tag that comes with them, so I usually just buy the Yankee Melts or the mini sized candles. 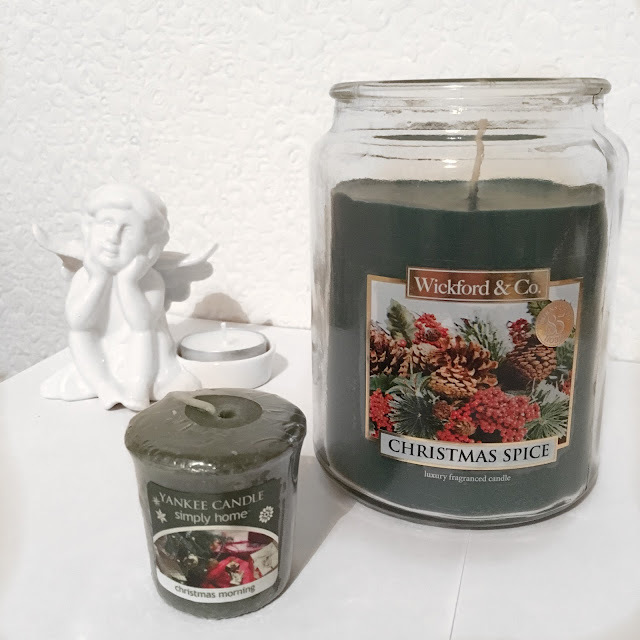 I picked up my Wickford & Co candle in a store called Home Bargains, they had this one and 2 other scents but I went for the Christmas one....not that I need anymore candles as I have loads, but hey one more won't hurt will it?! The only difference with the candles is the name of them, where the Yankee candle is called "Christmas Morning" and the Wickford & Co candle is called "Christmas Spice". I'm not sure how long Home Bargains will be selling these for as it's the first time I've ever seen them in the one where I live, so be sure to go grab a bargain if you have one of these shops where you live.